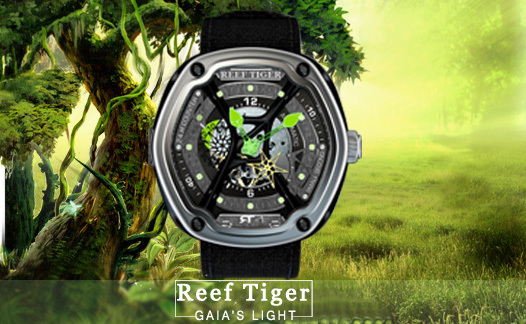 Reef Tiger the first introduced complex watches - Gaia's Light, its design inspired by the graceful curve of the nature of organic plant, echoes with the sense of urgency caused by the passing time. 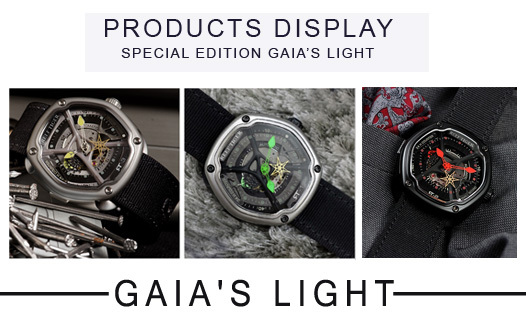 The Gaia's Light designed and completed manufacturer in Swiss, using particulate blasting hexagon steel skeleton, the diameter is 48 mm. 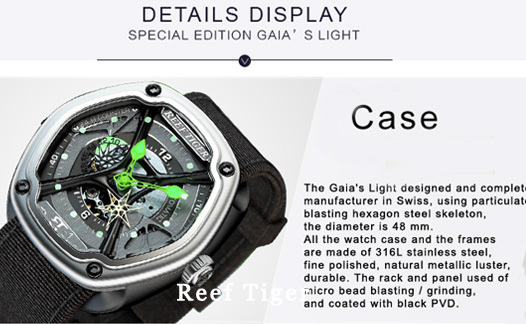 All the watch case and the frames are made of 316L stainless steel, fine polished, natural metallic luster, durable. The rack and panel used of micro bead blasting / grinding, and coated with black PVD. Crossover display by carved black Roman numerals and luminous material. The small seconds dial is located at 5 o'clock, presented as a hollow hexagon. The buds shaped hands and dot scales both used luminous material, people can read time easily in dark. The 24-hours indication located at 10 o'clock.